Wee Travel Baby Equipment Rentals: Toronto and Vancouver, CA. carseat rentals, crib rentals, highchairs, strollers. What are the advantages of renting over borrowing or bringing everything with me? Can you deliver to the airport? Can I pick up the rental items rather than pay for delivery? Do you provide discounts for multiple items or extended rentals? What are the car seat laws in BC and Ontario? Are your products clean and safe? What should I do if the car with our rented car seat is involved in an accident? What if I am not satisfied with the equipment provided? The baggage restrictions and excess baggage fees can make it very expensive to bring everything with you. Airlines such as WestJet and Air Canada typically allow 1 pieces of checked and 2 carry-ons per paying customer, and charge excess baggage fees of $35-$175 per bag depending on whether the flight is domestic or international. And, if the excess bag is overweight and/or oversize, baggage fees can double or triple. If you are considering using a car rental’s seat vs renting from us. We guarantee that our seats are cleaned, inspected and come with their manuals. All are well within their expiry dates and are replaced immediately if a customer is involved in a motor vehicle accident. We are experts on our car seats, and can provide you with all the specifications to ensure a proper fit for your child. There are 3 ways to place an order: by phone, by email, or by submitting an order form. Details can be found on our Reserve/Contact page. We suggest you place your order as early as possible to ensure we can accommodate your request. During peak times (holidays, long weekends, summer months) it is best to book several weeks in advance. During other times of the year, one to two weeks notice is sufficient. We will do everything we can to accommodate last minute rental requests. No, you may rent for as little as one day, however there is a minimum $10 on orders. During peak season (July, August, December) you may be subject to a minimum rental fee. Yes, there is a delivery/pick-up charge which is based on the distance traveled to your destination. We will be happy to provide you with a quote. We can deliver to the airport in Toronto and Vancouver. At this time we can only delivery to the car rental companies at the Victoria Airport. 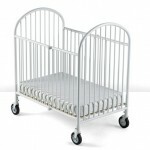 Unfortunately we cannot deliver folding cribs to the airport, but we are happy to make alternative delivery arrangements. You are welcome to pick up your rental items from one of our convenient locations: the East Vancouver area in Vancouver, and South-West Toronto area in Toronto, Esquimalt in Victoria. Yes, we do offer discounts. The discount rate depends on the location, items and rental duration. Please contact our office for more information. We know what it’s like to travel with children, and we try to be flexible. We ask that you cancel more than 48 hours before your reservation time, and anything after that may incur a cancellation fee of up to 2 days of the rental cost. Orders booked for pick-up or delivery the same day and then cancelled may be subject to a $10 processing fee. We accept Visa, MasterCard, Amex, Discover Card. A credit card is required to hold your reservation. A rental agreement/waiver must be signed to complete your order. We do not accept cash or debit. In Ontario, booster seats are required for children under the age of 8, weighing more than 18 kg but less than 36 kg (40-80 lbs) and who stand less than 145 cm (4 feet 9 inches) tall. In BC, this law is in effect from when a child is 18 kg (40 lbs) to age nine or 145 cm tall (4’9″), whichever comes first. Every item is meticulously cleaned and sanitized before and after every use using environmentally friendly products. Any laundered material is done with fragrance-free detergent. Baby equipment is safety inspected after each use. We are alerted by Health Canada if any of our products are recalled, in which case they are removed from our inventory. We take car seat safety very seriously – If a customer is involved in a motor vehicle accident, no matter how small, we immediately recycle the seat and will get you a new seat asap. All of our top-of-the-line equipment is purchased new and is replaced on a regular basis to bring you the latest gear in new condition. We thoroughly research items before we purchase them to ensure that they meet our high standards and the unique needs of travelers. If you are involved in a motor vehicle accident and have one our seats in the car (installed/not installed) – please let us know right away. We work with manufactures to determine if seats need replaced and work with your car insurance to replace them if required. We never rent car seats that have been in accidents. If you are not satisfied with a piece of equipment, please call us as soon as you receive it and we will be happy to provide a replacement as soon as reasonably possible or refund your money.